I was delighted to receive your message first! Thanks. What is the background of this release? Kindly let us know. First Day Covers from post offices. These covers would have the stamp mounted and the facsimile of the post office affixed with care w/o defacing the person honoured though the stamp would bear the cancellation mark just touching the fringes of the stamp. All stamp collectors usually throng post offices to collect the First Day Cancellation Covers. We too can buy those covers as Souvenirs of personal possession. Good News. Warm regards K. Raman Madurai. Well. On searching the net I got some details. This is the 100th year for Cinema and as such about 50 important film personalities stamp had already been released by the Honorable President Shri Pranab Mukherji on May 8 2003. But on seeing the sites one can understand those 50 stamps have been issued of the personalities who had passed away. 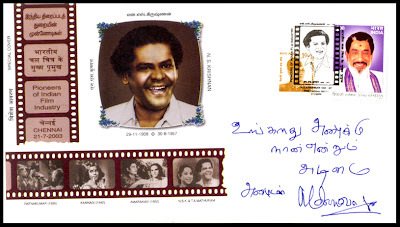 But now the issue of Stamps of a living personality like MSV is still not clear. But it is do with the 100 years of Cinema. Further to my SMS on the release of postal stamp in honour of our Master Creator Shri. MSV sent to many of the core group of MSVTIMES.COM couple of days back, I wish to inform you all that the original date scheduled for August 17, 2013 stands postponed. New dates are being worked out and will be announced as soon as we hear from the organisers.